A 1972 Times-Picayune article detailing the discovery of coffins buried in the French Quarter. October is Louisiana Archeology month! And this week’s TriPod New Orleans at 300 digs into the discovery, and rediscovery, of New Orleans’ first cemetery. When you walk around the French Quarter, you see all kinds of tours going by- intimate horse drawn carriage tours, ghost tours, architectural tours. But most tours don’t touch one of the neighborhood’s most significant landmarks. Probably because you can’t see it. But they should believe him. He has proof. Gray’s talking about the time he conducted a test dig in the French Quarter in 2011. It was for a property owner preparing to install a pool in the courtyard of his condominiums on Rampart Street. The owner wanted to make sure there was nothing underground that would get in the way of construction. On Gray’s his last day of digging, he plunged his shovel five feet down, and hit that piece of wood…it was a coffin. “Just below the water table” Gray adds. “So there's water kind of filling into the excavation unit at the same time. “And as he’s standing in a five feet hole with water rising up towards his ankles, Gray thought- jackpot. By mother load he meant the rediscovery of St. Peter Street cemetery, the city’s first formal burial ground. Lee Leumas is the director of Archives and Records for the archdiocese in New Orleans. She stands in the archival vault, surrounded by every baptism, marriage, and funeral recorded by the Catholic Church. Lee Leumas stands in the archival vault of the Archdiocese of New Orleans, reviewing the city's oldest burial records. A lot of people think St Louis Cemetery #1 is the city’s oldest. Those iconic graves are above ground, and more accessible to tourists. But those people are wrong. New Orleans’ footprint was small when it was founded in 1718. About half the size of the current French Quarter. So the Catholic Church created a cemetery outside the city limits- across the moat- to bury the dead. And everyone who died in New Orleans, white people, free people of color, enslaved people, everyone was buried in that single cemetery. Because everyone was Catholic. The St. Peter Street Cemetery remained the only burial grounds through the transfer of power from the French to the Spanish in the 1760s. Then, in the 1780s, the Spanish decided the city had outgrown St. Peter Street. It was time for a new cemetery. So the St Peter Street Cemetery was officially closed by 1800, and the Spanish government ignored the Catholic Church’s pleas and developed right on top of the burial grounds. Many of these early 19th Century buildings still stand in the French Quarter today. Which brings us back to 2011, when archeologist Ryan Gray’s shovel hit a cypress coffin five feet underground on Vincent Marcello’s property. But Ryan wasn’t the first to discover the cemetery. He says in 1972, construction in the French Quarter turned up some human bones. Marcello didn’t want to be a ditch witch. A group of archaeologists from Earth Search lift a (very heavy) 300-year-old cypress coffin out of the test dig site to head to the LSU FACES forensics lab for analysis. Thirteen coffins and two standalone bodies were lifted from the ground and sent to a forensics lab at Louisiana State University. Ginny Listee is a forensic anthropologist and a bio-archaeologist at LSU. She and her team found that the 15 skeletons were of all different ages and genders- infants, toddlers, teenagers, young adults, older people. The studies also determined certain habits among this small cross section of Louisiana’s first inhabitants. Archeologist Ryan Gray says these findings are a nice window into the degree of Native-African mixture in early Louisiana. This gave him an idea. His test dig permit specified that the remains must eventually be reburied in sanctified ground. 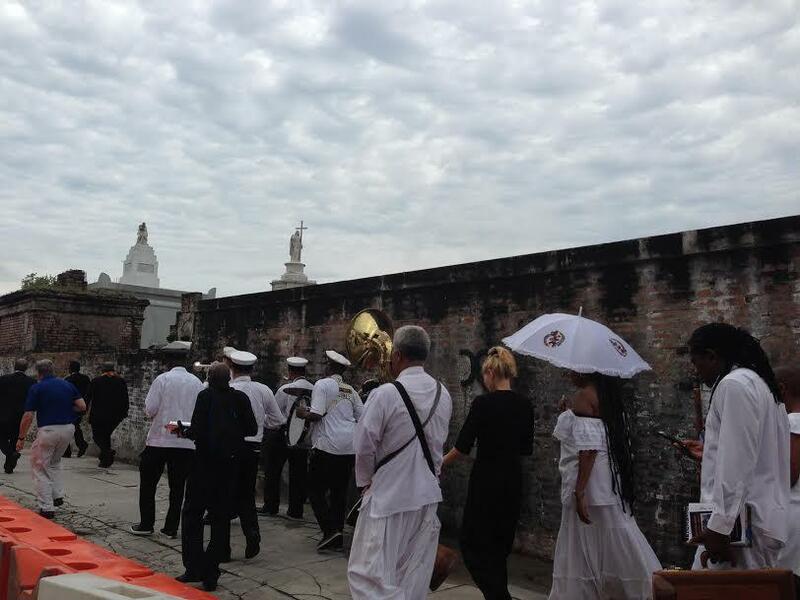 St. Augustine Church in the Treme agreed to host a mass for the reburial of this diverse group of early New Orleanians. On April 18, 2015 , Choctaw and African dancers and drummers, the Treme Brass Band, and the Black Men of Labor social aid and pleasure club came together to honor the mixed heritage of black and native peoples before reburying them in the city’s second Catholic cemetery, St. Louis #1. “It was an event that ended up drawing on catholic traditions, west African traditions, and Native American traditions to try and draw all these things together,” says Gray. The Pool of Souls, completed. Peaceful, haunted, or both, hundreds if not thousands of bodies- the first people of New Orleans are still buried beneath this 600 block of Rampart and Burgundy in the French Quarter. And of all the legends that float over and under the city’s oldest streets, this is one to honor, and believe. There is a common myth told about 19th-century New Orleans. It goes something like this: Imagine you’re in an elegant dance hall in New Orleans in the early 1800s. Looking around, you see a large group of white men and free women of color, who were at the time called quadroons, meaning they supposedly had ¼ African ancestry. The mothers play matchmakers, and introduce their daughters to these white men, who then ask their hand in a dance. Tripod New Orleans @300 revisits the UpStairs Lounge Fire in the wake of last month’s Orlando Pulse Night Club shooting. In 1973, Clayton Delery-Edwards was living just outside New Orleans in Metairie, going to high school and- as he puts it - wrestling with "the G question." Clayton’s talking about being gay. TriPod: New Orleans at 300 returns to remember the 1866 massacre at the city’s Mechanics' Institute. It’s part of a series of episodes on the Reconstruction era.